A Dutch painter known for color blocking. PIET ( Pieter Cornelis) MONDRIAN was born on March 7, 1872 in Amersfoort, Netherlands. He was an important part of an art movement called the DeStijl Art Movement. His clean use of line and grid shape, along with the use of primary color blocks, is still modern and refreshing today. A Mondrian jumps out at you from among the muted oils and shadowy figures of the master painters and it had a distinct energy urban about it. Piet Mondrian termed his art Neoplasticism, which is a white background with black grid lines and three primary colors. His peers called his work the closest thing imaginable to pictorial harmony. He said his work was a study in the positive and negative. He claimed the positive and negative broke up the oneness of the object, that oneness was the cause of all unhappiness, and that the union of positive and negative was HAPPINESS! Now, who doesn't want happiness? It is said that his New York City Studio was spotless white, more like a laboratory than an art studio. The only color were rectangular matboards in eye-popping primary colors, and he would rearrange them from time to time to make them look more cheerful. Piet Mondrian looked more like a school teacher than an artist. He died in New York City on February 1, 1944, but his influence has been felt for centuries afterward. With the development of the Minimalist Movement of the late 1960's, Mondrian's work came to the forefront in all sorts of unexpected places, like Yves. Saint Laurent's Colorblock clothing line and the cover of the rock band White Stripes 2000 album, De Stijl, as well as using his name for three "Mondrian" hotels in New York, Los Angeles, and Paris. Famous Piet Mondrian Quotes: "The emotion of beauty is always obscured by the appearance of the object. Therefore, the object must be eliminated from the picture." "To approach the spiritual in art, one will make as little use as possible of reality, because reality is opposed to the spiritual." "I don't want pictures, I want to find things out." Resources for the above information: Vision and Verse; Piet Mondrian. 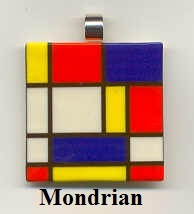 Wikipedia; artchive.com; theartstory.org; Mondrian Trust, The Official Site.